Water chestnut pudding from The Chairman (大班樓 馬蹄糕) - one look at the pale color tells me that this is gonna be different from what I'm used to having. Unfortunately, this was a total failure in terms of taste - possibly even worse than the one from Lei Garden. Yes, there's a good amount of water chestnuts, but why is it so bland?! And the texture was a little on the springy, almost rubbery side… Not good. New year pudding with muscovado and ginger from The Chairman (大班樓 黑糖薑汁年糕) - this came highly recommended by two foodie friends, including KC who accompanied me to test out the next pudding. Not exactly traditional, but very tasty. While I have no doubt that the flavors of muscovado from Taiwan were yummy, not surprisingly the ginger pretty much overpowered everything. Mom especially liked the fact that it tasted of freshly ground ginger. Very special. Water chestnut pudding from Fook Lam Moon (福臨門 馬蹄糕) - this was what I tested out last time, and while I lamented about the sparing use of water chestnuts, it was still pretty tasty. Mom was pretty happy with my choice, as it just completely left the Chairman's version in the dust. Mom thinks the difference is the use of water chestnut juice, as the entire pudding was filled with the fragrance of it. 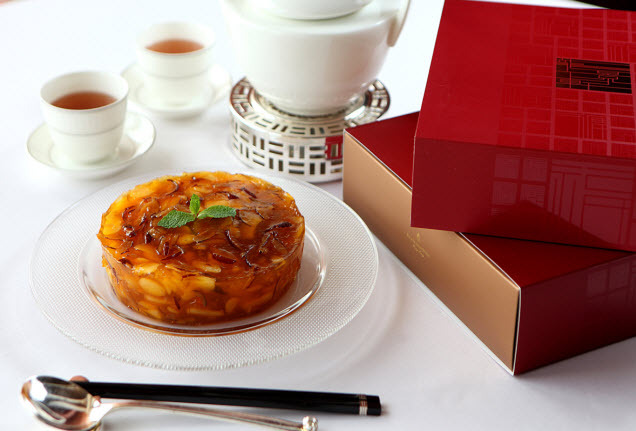 Water chestnut pudding with red dates and lotus root from Lung King Heen (龍景軒 紅棗蓮藕馬蹄糕) - I had very high expectations for this, as I've been a fan of other goodies from this 3-star restaurant. I was especially attracted by the beautiful picture on the Four Season Hotel's website, showing a beautiful pudding stuffed full of goodies. However, the real thing I got looked just a liiiiittle different… The color was neither attractive, nor was there as much stuffing inside as the promo photo seemed to suggest. Granted, there was still a lot of stuff inside, but I think there was a noticeable difference. Lunar new year pudding with organic sugar cane and coconut juice from Lung King Heen (龍景軒 四季有機年糕) - this was the most traditional of them all, and I didn't expect much surprise from this. Taste-wise this was pretty decent, although mom wished there was a bit more coconut flavor. I thought the texture was pretty good. Finally there was the jujube pudding (紅棗糕), which was homemade and came from J's kitchen. This was consumed "as is" without pan-frying. The layers provided plenty of jujube flavor, and I really liked it. The only drawback was that the texture was a little hard, and they didn't wobble or jiggle as I hoped they would… I steamed the next one and it tasted much better, both in terms of flavor and texture. LOVE This post and your blog. Happy CNY!